TL; DR: Traditional forms of sales prospecting have become less and less effective and leveraging sales trigger events has become a top priority for sales and marketing professionals looking to improve their B2B sales prospecting results and generation of B2B sales leads. But what exactly are sales trigger events, how and when do you leverage them and how do you create a systematic process that keeps things manageable? Below is a complete guide on sales trigger events to help with your lead generation strategies. Harvard research shows the first person to connect wins more of the deals. Fundz lets you connect first with thousands of just funded startups. Selling is hard. Prospecting is harder. Some 40% of salespeople [Source: @HubSpot] reported that prospecting is the most challenging part of the sales process. (Click to tweet!). It takes, on average, 18 calls to connect with a buyer. Then, you still need to qualify them to turn them into business leads. Salespeople are always looking for new and better ways to contact prospects. Contacting a prospect at the right time is crucial. This is what makes prospecting easier. When you reach out to a prospect based on a trigger event, it increases conversion rate by a whopping 400%. Companies that has been recently funded are 8x more likely to buy [Source: @CraigElias] (Click to tweet!). It all comes down to when you contact your prospect. As InsightSquared says: If you’re not using trigger events for prospecting calls, whether they are internal or external trigger events, your entire team is missing out on a valuable sales technique. If you happen to contact at the right time with the right offer, you won’t have issues generating sales. 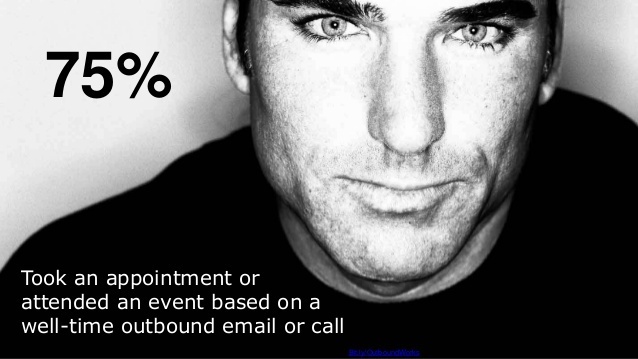 As much as 75% of prospects respond to a well-timed email or call. This is what’s known as trigger event selling. If you don’t know how it works or if you want to improve your sales trigger event game, this is the guide for you. It will cover everything around sales trigger events: what they are, how they work, how you can create your own trigger event selling system, how to monitor trigger events, and much more. You won’t have issues generating leads and sales after reading this guide, nor have to rely on lead generation companies. HubSpot defines a trigger event as an occurrence that creates an opening for a marketing or a sales opportunity. A sales trigger event is, therefore, an event that specifically creates an opportunity for sales. Craig Elias, who is the author of Harness the Trigger Events That Turn Prospects into Customers, calls trigger events ‘silver bullets’ in sales. Why? Because trigger events let you get your product (or brand) in front of the right person at the best time - when they are most likely to buy. A sales trigger event is also defined as a change in the status quo that compels a prospect to take action and change the current situation. For instance, your prospect's competitor launching a new product that turns out to be a huge hit may require a change in their marketing strategy. Statistics show that 8 out of 10 B2B purchases are unplanned. These unplanned purchases are a result of trigger events. For instance, if a business gets funding, it might make several unplanned purchases such as project management app, marketing automation tool, analytics tools, etc. Whether you’re in B2B or B2C industry, you’ll find several trigger events that will provide you with an opportunity to contact a prospect. This calls for constantly analyzing external as well as the internal environment for any trigger events that might help you generate sales. The best thing about trigger event marketing is that it makes your timing perfect. According to Craig Elias, trigger event selling is all about timing and salespeople who are the first respondents after a trigger event happen to win a sale 74% of the time. When it comes to sellingp nothing beats timing. Bill Gloss, the founder of Idealab, helped more than 100 startups since 1996. He said in a TED talk that timing is the most critical factor that makes any startup a success. Z.com, for instance, was a video streaming website that was launched way before YouTube back in 1999. But it failed badly. It was launched at a bad time. When Z.com was launched, people were unable to stream online because broadband wasn’t common and there were some major codec issues. In 2005, YouTube was launched which happened to be the perfect time for an online streaming site because 50% of the US population was using broadband and codec issues were solved by Adobe Flash. YouTube, launched at the right time, was a huge success. We all know it. Same goes true for selling. Brian Carroll, CEO and the founder of Markempa, worked with a SaaS company that was selling management software to businesses. He discovered an event trigger when a CEO talked about innovation or improving innovation publicly on social media, blog posts, annual report, conference, etc. All such companies were tracked and pitched whenever their CEO talked about innovation. These companies had 400% higher profitability buying the software. This specific trigger event was key to the software’s success because it was a clear indication that the company had a motivation for change and the CEO is all into it. Generating leads and converting those leads gets a whole lot easier if you understand what triggers your prospects. It all comes down to tracking all the critical events. Here is a 3-step process to use sales trigger events for lead generation, which will yield much better results than you'll get from lead generation services. Review most recent 15 to 20 sales and look for patterns and common events. Are there any life events that resulted in sales? Did sales rise after a recent funding? Do sales decline when prospect’s competitor launched a new product? How was customer’s interest created in your product? What was the primary motivation behind the purchase? You might not find any trigger events at all, and it is absolutely fine if you don’t find any pattern. In this case, it is best to conduct a short survey with your recent customers. Ask them what triggered them to buy your product at this point in time. The whole point of reviewing recent sales and conducting surveys and interviews is to identify all the trigger events. List all the trigger events. You can read more about most common trigger events in the next section, keep reading. For instance, left the company is a common trigger event that your business should capitalize on. If you received an email like this, it means you need to get in action and generate b2b sales new leads. If you have devised a plan, things will get easier. You'll quickly update CRM, add Jenni as your new contact, and proceed. But there is more you should plan about. You cannot leave Pamela because she was your current customer and you should get in touch with her too. She might become a customer at her new company and bring new clients. At the same time, you should get in touch with Jenni to ensure you don’t lose business with this company. You can also dig a bit deep and get in touch with the person who replaced Jenni at her old position and who Pamela replaced at her new job. These will be people who share similar positions, and since this position is your lead, getting in touch will be a good idea. To achieve this type of in-depth prospecting, you need to create a plan for every trigger event that you identified. This will semi-automate lead generation process and every time a trigger event will happen, your sales and marketing team will know what they have to do. This is what makes lead generation super-easy. Trigger events work for both B2B and B2C. But they're mostly used for B2B sales and lead generation. 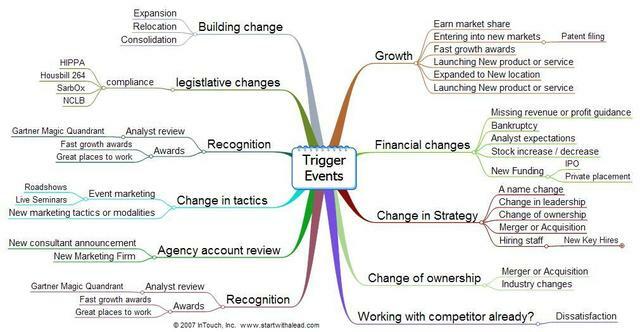 Triggering events in strategic management, sales, and marketing can take any form but they're mostly related to financial changes, new hires, growth, funding, change in tactics and strategy, market growth, increase in sales, new product, and increase in growth. Here are a few B2B strategic management, sales, and marketing triggering events that you should never miss. Strategic management: New executive, merger, layoffs, relocation, new office, change in strategy, restructuring, resizing, etc. Sales: Increase/decrease in customer-base, sales team bonuses, sales team training, new product, increase/decrease in sales, etc. Marketing: Increase/decrease in the marketing budget, new CMO, new target marketing, new target segment, change in the marketing channel, etc. As soon as one of these trigger events happen, you need to be the first one to capitalize on it, get in touch by following your plan, generate a lead, and convert it. The whole point is to get notified well before others so you get a chance to set up a phone call, send an email, or arrange a meeting. The earlier you take action, the better. If you’re not sure what you should talk about with your prospect on your next call, a good idea is to talk about one of the following sales trigger events. These trigger events provide you with a solid reason to get in touch with your client/prospect. Here are 18 leading sales trigger event examples and how to track them. When private companies announce they have raised money from investors, a significant opportunity opens up for a limited window of time. In fact, companies that have recently raised funding are statistically much more likely to buy from you. However, while its widely known funding rounds are an important sales trigger event, Harvard & Berkeley research shows you need to be first person representing your particular type of product or service to greatly tilt the odds in your favor of winning the business. How to track: Track every funded startup in the U.S. with Fundz. Again, you need to be the first person representing your particular type of product or service to greatly tilt the odds in your favor of winning the business and unlike others websites or once a day funding round emails profiling the same limited number of fundings, Fundz delivers all fundings in real-time as filed with the SEC, giving you a big advantage to connect ahead of your direct competitors. Whenever a company hires a new executive, you get a chance to reach out to him or her and establish a relationship. Because new executives are charged and eager to prove their value. And they are more likely to purchase your product as compared to an executive who has been with a company for years. How to track: LinkedIn, Google alerts, Twitter, press releases, and leading news sites. Did your prospect announce a new customer? New customer means your prospect just received a lot of money and this is the right time to help your prospect use money for the right purpose. Watch out for new customer announcements. How to track: Industry news, Google alerts, press release, and relevant hashtags. Whenever your prospect’s company is expanding, you have a great chance to join hands because expansion means it will need equipment, supplies, furniture, new hires, and so on. 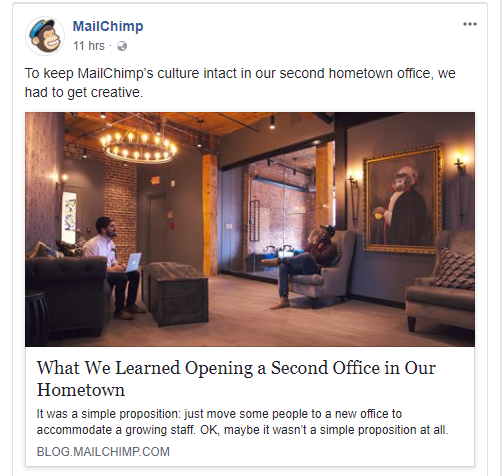 Imagine if MailChimp opened a new office in your hometown, how’d you capitalize on it? How to track: Google alerts, prospect’s social accounts, press release, and news sites. When your prospect moves to a new city, that’s where they're in need of products and services. Reaching out when your prospect’s company relocates have a high chance of getting a sale. How to track: Company website and social accounts, press release, and news sites. Did your prospect launch a new product in a new target market? This means business. Depending on what you sell, a new product or service announcement means that the company will look for new vendors, equipment, services, and that’s where your product can fit. When your prospect’s competitor announces a new product, your prospect needs to make its move too. If you or your product can help at such a moment, don’t hesitate to reach out. How to track: Industry news, press release, and social media. A new product or service by a competitor isn’t the only time when your message might be heard, in fact, whenever your prospect’s competitor makes a major move, you need to look for an opportunity. For instance, if a competitor launched a new marketing campaign with a bang, your prospect will be preparing to respond and if you deal with marketing automation, you can reach out with your service. How to track: Press release, news sites, and social media. Is your prospect had a bad quarter and is losing money? You can contact and offer your product at a discount or if your product/service has the potential to help a company that’s losing money, count yourself in. How to track: News, Google alerts, and social media. When your prospect’s company is making money, you know what you have to do. This is the best time to contact and pitch because they have the money. How to track: Company website and social media accounts, news, and Google alerts. If your prospect merges with another company, you have a great chance to earn revenue by making additional sales. Same is true for acquisitions. While a merger or acquisition might result in loss of business too but if you know how to pitch your product, you won’t lose your prospect in the process. How to track: Press release, news sites, and company website. A new industry development could either mean an opportunity for your prospect or it could be a threat. Depending on how your product can help, reach out to your prospect as soon as you get the news. How to track: Industry news. New legislation can pose threat or bring new opportunities and if your product can be of any help to a prospect, get in touch immediately. This is one of the best moments to reach out with a helping hand. How to track: News sites. Is your prospect’s expenses on the rise? You can push your message and offer your product at a hefty discount. Or, if you offer a product that helps businesses reduce their expenses, you have your day. How to track: Local security exchange commission website. A new award won by a prospect company means it is moving in the right direction. This could be your chance to pitch your message. Provide your prospect all the information and resources it needs to stay ahead of the competition. How to track: Company website and social media. There are analysts in every industry that analyze and rank companies. Look for analyst reports in your prospect’s industry and find a way to reach out. For instance, if your prospect is ranked high, it might be interested in maintaining the same position. Or, if it was ranked low, it might be interested in products/services that will help it improve ranking. In any case, you get a chance to close a deal. How to track: Analyst website and social media accounts. Is your prospect entering a new target market? This sounds to be a perfect trigger event that can help you land a sale. New market entrance isn’t easy and your prospect will need several resources. That’s where your product/service can fit. How to track: Company website and social media accounts. There isn’t any better sales trigger event than your prospect making a new event announcement. If your product is related to the event management, you can jump in. You don’t have to track all these sales trigger events instead you have to identify the most appropriate events for your business and track them. The next section is all about dealing and managing sales trigger events. Managing sales trigger events is challenging because, at any given time, you’re dealing with numerous events. Tracking all of these events gets challenging especially when your business grows. This is why you have to stick with a systematic process that keeps things manageable. Let’s dig deep and see how you can get started. This is the most challenging stage. Unfortunately, most of the businesses aren’t able to identify right sales trigger events for their business, and that’s where things get tough. When your sales efforts are associated with a wrong trigger event, you won’t generate enough leads or sales. Ask yourself: What circumstances or events generate a need for your product/service? Any event that generates a need for your product is a sales trigger event even if it hasn’t been discussed in any book, article, or on the internet. Don’t look for generic sales trigger events or trigger event examples that have been discussed hundreds of times on the internet. If it doesn’t generate a need for your business, it isn’t a sales trigger event and you shouldn’t be tracking it even if everyone else is crazy about it. So how you identify sales trigger events that generate a need for your product? It can only be achieved if you link trigger events to buyer personas. You need to identify trigger events for all the buyer personas that you’re targeting. A buyer persona is a fictional representation of your ideal customer. A buyer persona or a marketing persona helps you better understand your ideal customer. Every business has one or more ideal customers that it targets. You have to create a buyer persona for each ideal customer. If you have five different types of ideal customers, create five personas representing each ideal customer. You need to create buyer personas for these four ideal customers. The way how you target a SaaS founder is different than how you’d target an app designer. A buyer persona will tell you everything about your ideal customer including demographics, challenges, pain points, achievements, life objectives, hobbies, interests, goals, and so on. Once you have identified all the buyer personas that buy your product or who are your ideal customers, the next step is identifying sales trigger events that get your buyer personas into buying mode. Take your SaaS CEO persona. What will trigger him to develop an interest in your app? A newly appointed CEO of a SaaS company will be extremely likely to listen to you because he needs something to get started instantly. 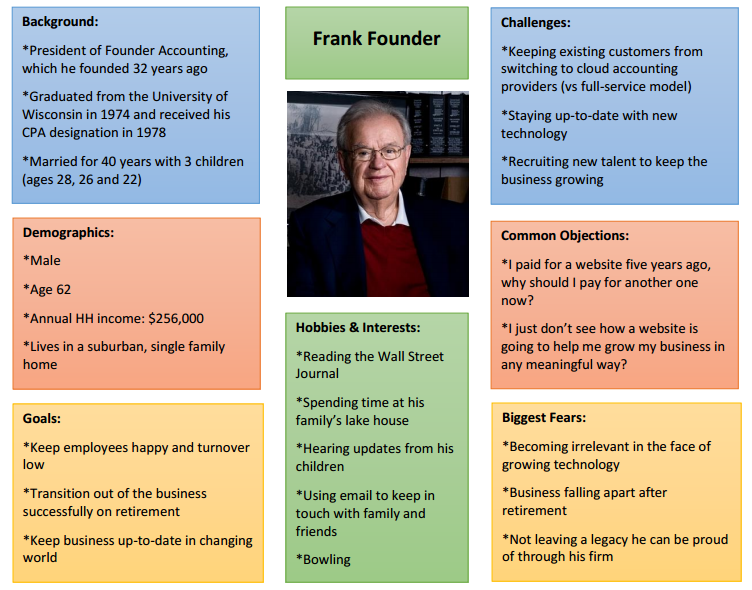 CEO appointment is one trigger that will work for SaaS CEOs persona. It won’t work for other personas. Similarly, a marketer who gets a new SaaS client is more likely to use your onboarding app to improve onboarding process for his new client. That’s where you can close a sale. This trigger event won’t work for other personas. You need to identify all the sales trigger events for all the buyer personas. Better yet, you can create a separate head for trigger events within your buyer persona. It will make things easier. Invest in market research. For instance, find out when SaaS founders and CEOs are most likely to buy a user onboarding app. Conduct surveys and interviews with existing customers and non-customers. This is the best approach that will reveal most appropriate sales trigger events. For instance, you can ask SaaS CEOs what events persuaded them to invest in a customer onboarding app. Identify 5 to 10 trigger events for each buyer persona. Each trigger event should be relevant to the buyer persona. There shouldn’t be any irrelevant trigger events. So you have identified a handful of sales trigger events, what’s next? You need to develop a system to track all the trigger events. Your system should be automatic or semi-automatic. Follow these steps to create your trigger event tracking system. You need to figure out how you can best track a sales trigger event. Refer to the trigger event examples discussed above. You'll see that most of the trigger events can be tracked by monitoring company’s website and social media accounts. You need to subscribe to the prospect company’s website, follow it on social media, activate Google alerts for relevant terms, follow founder, CEOs, and marketers you’re targeting, and subscribe to leading websites that talk about customer onboarding. Tracking 30 to 40 trigger events is a big task. An individual cannot track all the accounts and might miss an important event. And you don’t want to miss an event. You want to be the first one to reach out as soon as an event happens. Reaching out after a week when your competitors have already made the move is useless. You need to make sure you don’t miss any trigger event. Therefore, you need to assign accounts to different salespersons. Maybe assign 10 trigger events to one team member. Whatever works for your team is fine. The whole point is that you shouldn’t miss any trigger event and it should be tracked in real-time so you can take action as soon as it happens. Whenever an event triggers, one of your team members will get notified of it and you can proceed to the next step. The whole point of building a system to monitor sales trigger events is to take action as soon as it happens. You don’t want to delay your action. Because most events have a very short life. You need to be the first mover. Don’t wait for Monday, don’t wait for tomorrow, you have to act instantly. This is why your sales team should know what action they have to take in response to an event. All the actions must be predefined. You don’t have to create a marketing message when the event happens. That’s not how it works. You have the message ready and as soon as the event triggers, the message should be delivered. This is how you'll do better than everyone else. Let’s figure out how you can do it. What channel you choose depends on your relationship with the prospect and the type of the trigger event. Email is the most common way to reach your prospects. Let’s assume your prospect’s competitor updated its user onboarding process and is everywhere in the news. Your prospect now needs to react. If the salesperson knows SaaS founder personally, he should call him and deliver the message. However, if there haven’t been any previous contacts, the best approach will be to send an email. Each sales trigger event should have its appropriate channel assigned to it so that the person tracking the event should know what he has to do. All the messages should be created upfront. Your team should have the templates so they can quickly edit it and execute. If you create a message after an event triggers, you might get too late. Normally, it isn’t a big deal for salespersons to create a message that’s appropriate to an event but it is still a good idea to have templates ready for all types of events and situations. This makes your trigger event marketing super-fast and you'll be able to reach your prospect way before your competitors. Here is an example of how your template should look like. How and when you deliver your message after an event makes or breaks the deal. The message should be delivered instantly without any delays. If you assigned sales trigger events to different team members and you have messages ready, timely execution shouldn’t be an issue. What happens when you take action on an event? How often you get a response? Which trigger events work best? Did you identify right sales trigger events? Monitoring, analyzing, and optimizing will help you get better at trigger event marketing. You need to identify what works and what doesn’t. You need to monitor and analyze all the trigger events, actions, conversion rate, response rate, and other metrics. For instance, if a trigger event has low conversion rate or response rate, you need to remove it. Optimizing trigger events for better performance is a must. It isn’t a set-and-forget system. You need to replace events, add new ones, and tweak your marketing messages to get better. If you followed the steps above, monitoring and optimizing will get a whole lot easier. By now, you have your own trigger event selling system running and you know how to generate leads based on events. What if, your sales team has been waiting for events to trigger but it never happened. Or, trigger events you’re tracking happens once or twice a year. And it might be that when an event you have been waiting for months actually triggers, your prospect doesn’t know about it. You don’t want to end up like this, right? Here is how to deal with it. There are certain sales trigger events that you can create. Yes, you can. Marketing Grader tool by HubSpot is a great example. It is a free tool that grades a prospect’s website in terms of marketing best practices. 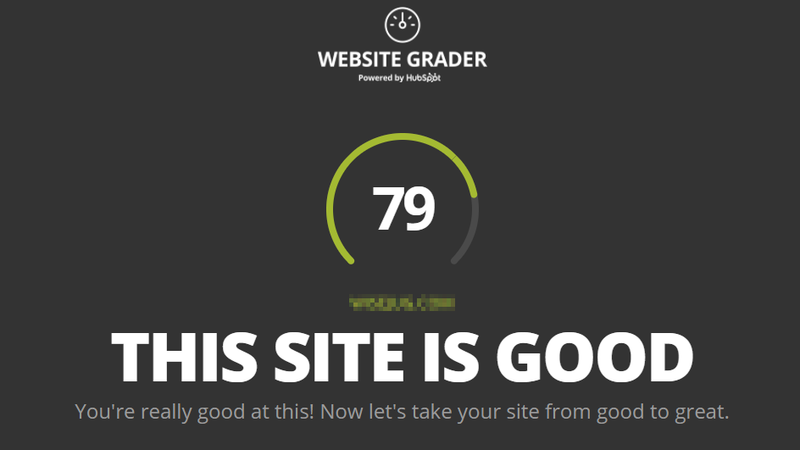 Each website gets a score which happens to be a powerful trigger that persuades users to improve their score. There is a CTA at the end that triggers users to increase their website score now. Businesses create sales trigger events all the time to generate a need for their product. Of course, you cannot hire executives, you cannot influence company’s relocation, and you don’t have any control on most of the trigger events discussed above but you can create and control your own trigger events. The whole idea is to create circumstances that generate a need for your product. Refer to the customer onboarding app example. Think of events that can trigger a need for your app. Create events where a SaaS founder should feel that he cannot go without your onboarding app. Show how your app helped another SaaS founder increase revenue/sales. Find a loophole in current onboarding process of your prospect, show how your app can fix it, and what benefits your prospect will enjoy after updating its onboarding process. Show how onboarding process is linked to user engagement and customer retention. These events create an opportunity for your sales team. Though these trigger events aren’t as powerful as external ones, you should test these as well. You never know these internal trigger events might perform better than external ones. You know a lot about trigger event marketing. It is time to get a step ahead. Here are a few advanced tips and tricks that will help you take your trigger event marketing to a whole new level. Measure and track everything you do. Consider trigger event marketing like any other marketing campaign. You have to define metrics to measure the success and failure of your campaign and tweak it. This is how you'll get better at tracking and capitalizing trigger events. Take action on trigger events instantly in real-time. There isn’t any room for delay. Be the first to reach your prospect immediately after a trigger event. Since you reach out to your prospect in real-time, there are fair chances that your prospect will be unaware of the trigger event. For instance, your prospect might not be aware of a recent technological development in the industry (for any reason). 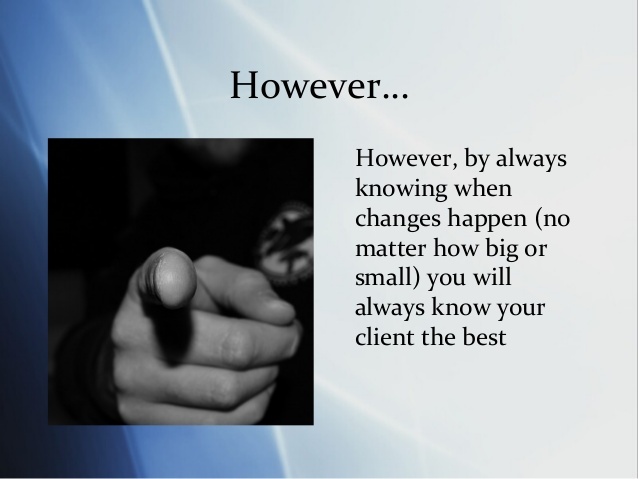 Therefore, whenever you contact a prospect, clearly communicate the trigger event. If you’re sending an email, link to the source. If you’re on phone, explain the trigger event. You need to create your messages in a way that they always communicate the event upfront to avoid any misunderstandings. A prospect that is unaware of the trigger event is least likely to convert. Don’t take any chances. Don’t hesitate to follow-up. If you don’t get a reply to your first email in a day, send a follow-up email. The follow-up should be well-timed. It is pointless to send a follow-up after three days of the trigger event. If your call isn’t answered, instead of retrying next day, retry same day. Give your best to every trigger event. Try making your trigger event marketing system automatic. Though it cannot be fully automated, do whatever it takes to make it run on its own. This will make your system efficient and you’d be able to react to trigger events immediately. Now that you know how to use sales trigger events to generate b2b leads and sales, it is time to get cracking. You don’t have to track all the sales trigger events discussed in this guide rather carefully pick the most appropriate ones, link them to your buyer personas, track them, optimize, tweak, and repeat. You’ll master b2b lead generation in a short period of time.